James Turnbull was born in Scotland on 14 March 1894. His mother was Mrs Agnes Turnbull, who lived in Gates Head County, in Durham, England. When James immigrated to New Zealand he settled in the Pleasant Point area and became a ploughman working for Mr John Fraser of Pleasant Point. When James enlisted on 14 June 1915 at Trentham, he joined C Company of the 7th Reinforcements. However, because of the overcrowding at Trentham, they sent the 700 men of the 7th Reinforcements to Waikanae on 13 July 1915 and set up camp at the racecourse. Wet conditions caused the land to become a bog which resulted some recruits being relocated to another part of the racecourse while other soldiers were billeted in the township. This new camp also had to be abandoned, and they relocated to the old river bed on 23rd July. 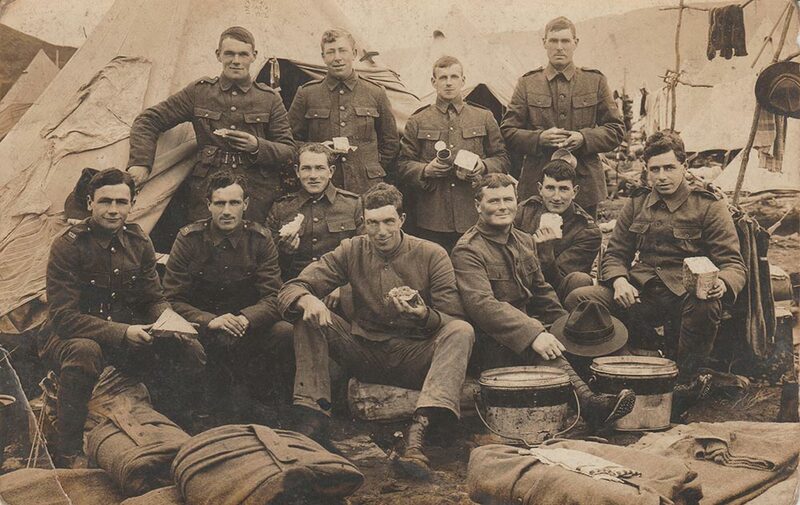 Even this final camp became unfit for habitation because of the wet weather and eventually on 7th August the men were sent on a weeks leave before having to report back to Trentham. The camp was closed on the 19 August. At the time of his medical, James was 21 years and 3 months old. The Medical Officer who conducted his medical exam on 29 May 1915, described him as being 6 feet 2 inches tall and weighs 169lbs, he has a chest measurement of between 35 and 38 inches. James has a fresh complexion, with grey eyes and dark brown hair. James was also a Presbyterian. Private James Turnbull left Wellington with the Canterbury Infantry Regiment, 12th Company of the 9 October 1915, it is most likely that he was on board HMNZT 34, the Warrimoo, which docked at Suez on the 18 November 1915. Private Turnbull joined his Battalion at Ismalia on 4 February 1916, he stayed with this unit and embarked with them onboard the "Trancoma" at Port Said bound for France on the 6th April 1916. The next time we hear about James is on the 17 September when he is wounded in the field and is admitted to No. 4 General Hospital two days later. Then is evacuated back to England onboard the "Sultan" on 23 September and is admitted to the 3rd General Hospital in Oxford on 25 September, 1916. Private Turnbull spends five weeks in Oxford before being transferred to the New Zealand Convalescent Depot in Codford on 3rd November where he is taken on strength. We hear nothing about James for a year, when he is in Sling Camp on 25 September 1917, where he is transferred to the New Zealand Section and attached to the Anzac Provost Corps, in London and appointed Lance Corporal. On 26 December 1918, James was appointed Temporary Corporal at the District Head Quarters and a month later his promotion was made permanent. Finally, Corporal Turnbull embarked for New Zealand onboard the SS Adolph Woermann in Plymouth on 14 August 1919. James had served in three theatres of operation during the war: in Egypt (1915-1916), with the Egyptian Expeditionary Force (1916), and in Western Europe (1916). James was discharged on the 31 October 1919, after the period of his engagement, he served a total of 4 years and 142 days. He was awarded the 1914-15 Star, the British War Medal and the Victory Medal. After the war James married Ethel May. James died on 1 October 1970, aged 76, he is buried with Ethel in the Timaru Cemetery, General Section, Row 141, Plot 368.